Parker Mays, Southwood High School valedictorian, was having trouble thinking of a profound message to leave his fellow classmates. So, he turned to someone close to him, his grandmother, and asked her for advice. The 2018 Chair Affair Committee recently announced that its charities of choice of the Chair Affair Auction will be 85 HOPE and T.A.D.A. (Teens Against Dating Abuse). 85 HOPE offers basic medical help with medications and offers health education to those with little or no health insurance. 85 HOPE was started in 2011 by Dr. Rose Wenrich and is located in Wabash Friends Church. Office hours are Tuesday and Thursday from 1 p.m. to 5 p.m. The clinic is open on Thursdays from 5 p.m. to 7 p.m. and is staffed by volunteers. T.A.D.A, in association with Hands of Hope, a division of Family Services Society, has groups at Wabash High School and Southwood High School. They meet once a week to come up with ideas for activities for teens to help make kids aware of the signs of unhealthy relationships. Hands of Hope works to break the cycle of domestic violence and sexual violence through safe shelter, advocacy and education. 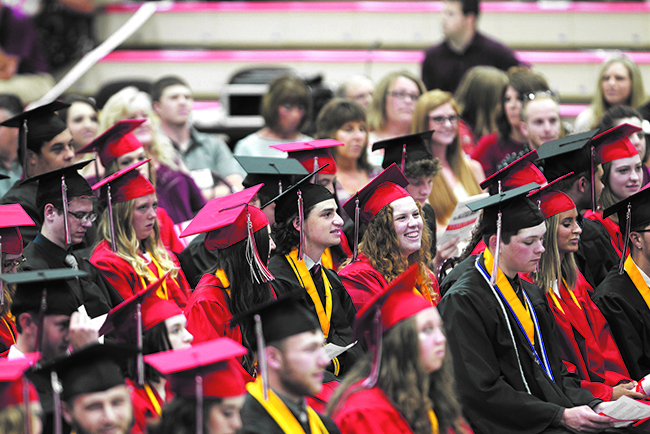 A group of 75 “winners” received their diplomas Friday night, June 1, at Northfield High School. The “winners,” as proclaimed by valedictorian Jake Fulkerson, were dressed in blue and silver caps and gowns, and were greeted by cheers and camera flashes as they walked across the stage during the school’s annual commencement ceremony. 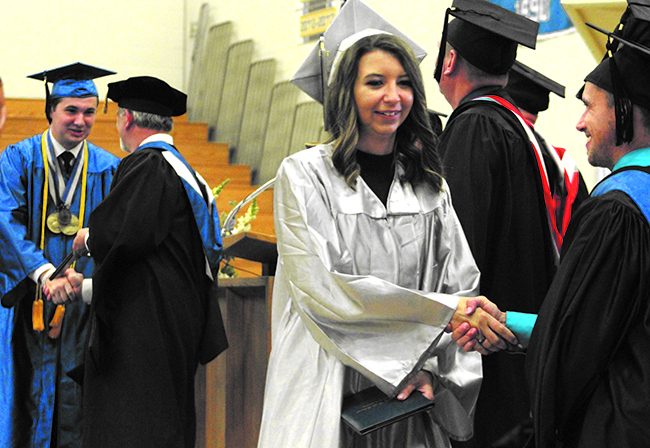 NORTH MANCHESTER -- After more than a decade of hard work and dedication, another class of Squires completed their education with a graduation ceremony Friday, June 1. A total of 118 students earned diplomas this year, with nearly all of them attending the graduation ceremony. Remington Trick, Student Council president and Class of 2018 valedictorian, welcomed his classmates and their family and friends, and gave the first speech of the night. Titled “No Excuses,” Trick's speech encouraged his classmates to embrace challenges and adversity. Trick's “no excuses” take on life is the product of advice from both his mother, who passed away in autumn 2014, and his father. Several Wabash County fourth grade students were recently honored for their efforts in the annual Wabash County Historical Museum Fourth Grade Essay Contest. The contest is open to all fourth graders within the county, including students who may be homeschooled or not a part of a public or private school. One winning essay was selected from each participating school, and that student received a $50 scholarship in memory of Dr. Robert Beckett in their college savings account. Additionally, an overall first, second and third place essay was selected at each school, and those students received a gift card to the Museum Store. “This essay contest was a passion of Dr. Beckett’s as he worked to inspire young minds through local history and we are honored to continue the program and to be able to provide funds into college savings plans in his memory,” said Mitch Figert, President & CEO of the Museum. On the morning of Thursday, May 24, Wabash High School had its annual Academic Awards and Scholarships Program. During the first half of the ceremony 155 different students were recognized for their academic achievements and successes in the classroom. The second half focused on the awarding of more than $550,000 in scholarships and grants to graduating seniors. LAFONTAINE -- Festivities for the 2018 LaFontaine Ashland Days Festival are set for Friday and Saturday, June 8 and 9 in downtown Lafontaine, with a variety of activities and events for the family to partake. Several fan favorite events are returning to this year’s festival. Registration for the Seth Zahalka Memorial Car and Bike Show will start downtown at 10 a.m. Saturday. Other returning events include the Pet Parade (6 p.m. Friday), Rubber Duck Race (1 p.m. Saturday), Tractor Show (5 p.m. Friday and 10 a.m. Saturday), and the Water Ball Fight (3 p.m. Saturday). The Community Foundation of Wabash County awarded a $12,000 grant to the Wabash River Defenders. The funds, a cash match for a State of Indiana Department of Natural Resources (DNR) Lake and River Enhancement (LARE) project and an Indiana Department of Environmental Management (IDEM) 319(h) project, will assist in the next phase of regional water improvement activities. The Wabash River Defenders (WRD), a local non-profit entity whose mission is to preserve, protect, and defend the Wabash River, promotes water quality, habitat, recreation, and awareness of Indiana’s primary river watershed. The DNR awarded $38,000 to the River Defenders, enabling them to engage professional services to perform a diagnostic study of the Silver Creek—Wabash River watershed in Wabash and Huntington Counties. In addition, the IDEM awarded $129,097 to create a watershed management plan for Treaty Creek—Wabash River watershed in Wabash and Miami counties.